The first thing on this oscilloscope that captures my attention was the faceplate on the top right of the device. This is for the 1.44MB 3.5″ floppy disk drive, featured in the TDS 340A, which probably shares the same enclosure design with the TDS 340. However, don’t expect to remove the faceplate and connect a PC floppy drive, or even a floppy drive from another TDS 340A, into the TDS 340 because the floppy drive interface board is not present on the TDS 340. This oscilloscope supports up to 500MS/s sampling rate and has a memory of 1000 samples. Two internal memory slots, REF1 and REF2, are available for user to store waveform data for manipulation. It also supports external trigger, delayed timebase and some math operations on the input signal. Overall, it is good enough for most of my hobbyist micro-controller and analog projects. The only thing I do not like about this oscilloscope is the AUTOSET feature. Among other things, it will set the acquisition mode back to 16-point average, instead of sampling. This causes a slower signal display, which is apparent when signal is removed from the probe – it will take a few seconds for the trace to update completely as the data points from the previous signal are still in the oscilloscope memory. Using the CURSOR menu, I am able to measure the first FFT peak of 1kHz, the fundamental frequency of the signal, and the harmonics frequencies. A good revision on FFT and signal theory which I learned back in my university days. Why is this the case? I leave this as an exercise for the reader. A hint is that the TDS 340 supports only average acquisition mode when FFT is used whereas the Rigol supports all acquisition modes (normal, average, peak detection) even with FFT enabled and has other menus to configure FFT window and sampling options. If these boards are used in the TDS 340, the printer power supply cable should be left unconnected. When purchasing a used Option 14 card, make sure it comes with the necessary cables. Mine came with the video cable but not the 50-pin cable. Luckily my 50-pin SCSI single-drive IDC female-to-female cable worked just fine. If you have to use a SCSI cable like what I did, make sure that the cable is single-drive and has no built-in terminators or other circuits to set the SCSI device ID, which may interfere with the communication and cause unexpected problems. The cable will need to be at least 40cm long to connect to the mainboard. Pin 2 of Option 14 DB9 VGA port (Video) connected to pin 2 (Green video) of VGA connector. 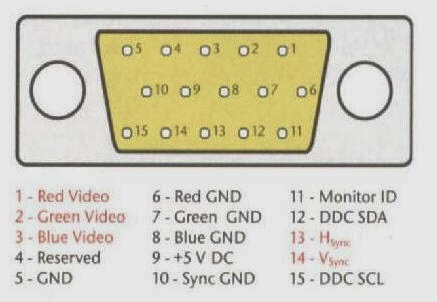 Pin 1 (Red video) and pin 3 (blue video) of VGA connector must be grounded. Pin 4 of DB9 VGA port (Horizontal Sync) connected to pin 13 of VGA connector. 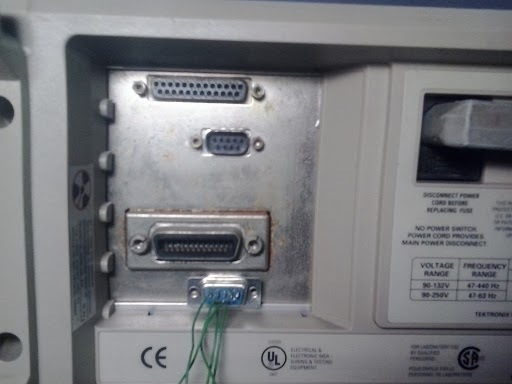 Pin 5 of DB9 VGA port (Vertical Sync) connected to pin 14 of VGA connector. Pin 6,7,8 of DB9 VGA port (Ground) connected to pin 5,6,7,8,10 of VGA connector. Pin 11 (Monitor ID) of VGA connector must be grounded. This indicates a 640×480 low-resolution VGA output and reduces the need to send monitor information via I2C using the DDC SDA and DDC SCL pins. As I do not have any of the supported printers or a device with a GPIB port, I can only test the hard copy feature via RS232. To try this, press the UTILITY button, choose System I/O from the bottom left menu, select RS-232 for Hcp Port and configure the proper serial settings in the RS-232 bottom menu. Disable “Hard-flagging” (refers to serial hand shaking via the dedicated lines) and “Soft-flagging” (refers to XON/XOFF software handshaking) as they are just going to cause problems. You can configure the output file format in the Hcp Format menu. The TDS 340 supports BMP, TIFF, PCX, PostScript (PS) and Interleaf image formats. Except for Interleaf which I couldn’t find a viewer for, the rest of the file formats are readable on the PC by most modern document viewers. You will need a cross-over serial cable and a computer with a serial port to receive the hard copy data. A USB to serial converter should work just fine as the data transmission does not rely much on the latency of the serial connection or the exact output voltage. To avoid having to rotate the image on your computer, the Hcp Layout option should be set to Portrait. bonjour j’ai le m? ?me oscilloscope le mien n’a plus de tube cathodique hs je l’utilise avec un ? ?cran de pc via la sortie vga qui est derri??re . Hi! Can you explain how to configure and use RealTERM in order to grab and save hardcopy from the TDS340A? Sorry for the late reply. The Hardcopy feature simply sends the bitmap data via the serial port. Just make sure that the serial settings (baud rate, parity, etc.) on both the oscilloscope and your terminal application (such as Realterm) are the same and choose to receive incoming files as raw/binary data on the PC. It will work and you can save the received file as bitmap or other formats selected on the oscilloscope hardcopy settings. Make sure you do not select a serial protocol such as Kermit or XMODEM/YMODEM/ZMODEM when receiving files as it will not work properly. You’re supposed to unscrew the two nuts holding the GPIB connector shell in place, lift that off and then install the option board in the scope, then reinstall the GPIB shell. There is no need to mutilate the back of the scope by cutting out the bars! Perhaps this was something that I overlooked when working with this scope. I did check but could not find any easy way to remove the bars, hence the need to cut them away. Thanks for sharing. Simply outstanding overview! Major timesaver with the helpful hints. Also the comments that point out the subtle, but important differences between the two sibling models.